Qualitative market research features small samples and the use of mainly open, unstructured interviewing techniques. These give the respondents the opportunity to respond to questions in their own words. It is possible with the help of qualitative methods to track down and correlate needs, attitudes, behavior patterns and opinions. The main objective of this kind of research is to obtain a deep insight into areas that have been little investigated so far. Qualitative research is capable of shedding light on the whole spectrum of a topic but its results are not representative in a statistical sense. In other words, this method enables all the things that can be said about a certain subject to be ascertained but it is not possible to say anything about how many people hold this opinion. See also: Why qualitative research works. Qualitative research methods are in-depth interviews or focus groups (as a rule with 6-8 participants). The funnel technique is employed in questioning, i.e. you begin on a relatively wide base and go more and more into depth in the course of the discussion, sensitive questions not being asked until right at the end. It is necessary for all of the sessions to be conducted by an experienced and psychologically trained research consultant. 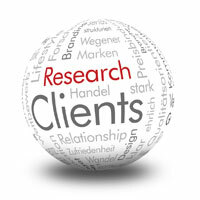 More about that: Why use a qualitative market researcher?